Difficulties in selecting a suitable topic. 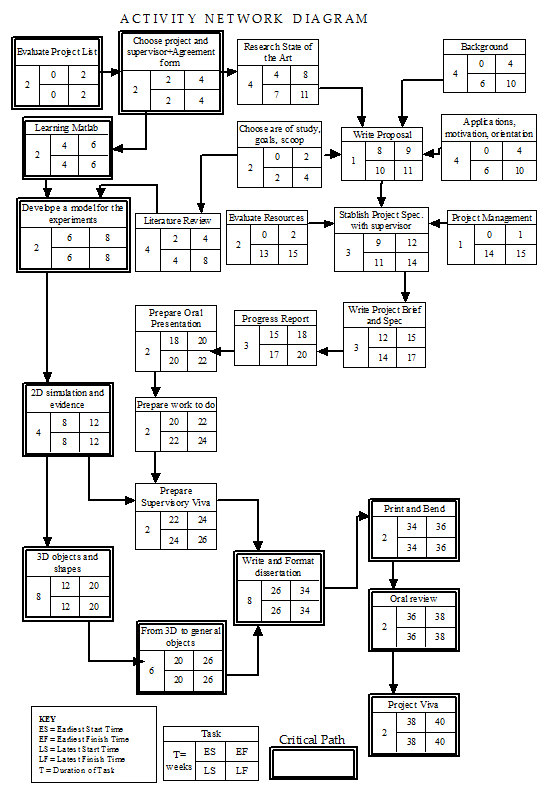 The problem of selecting an appropriate framework. Inability to manage available resources, in particular, time. For helping with these difficulties, a good project management is required, the major purposes of such planning are. Clarify the aims and objectives of the researcher. Define the activities required to attain these aims. Identify critical points or milestones. Not only this, but one of the most important aspects of project management is the development of a plan through which the project can be tracked and controlled to ensure the project meets the objectives. Thanks to these aspects we can evaluate where we are the job we have already done, if it has been successful, appropriate, etc. and the future tasks, resources we will need, and include modifications in the planning when necessary. A project like this comprises many different activities. Some of them are related and depending on others, but some others are independent. It is necessary to breakdown the project into different work packages, and these ones into different activities. Organizing this activities, and setting up the relations between them is important for managing the project. Meet milestones and schedules even with disposition of short time. Highlight significant activities which need to be anticipated. Identify major peaks of demand on time. Major or minor changes on the planning can be made dynamically. Efforts focused on achieving the next milestone, thus providing a way of regular review and evaluation of the process. In this project, network analysis would be very useful to represent the dependencies of the deliverables with the necessary previous activities (contact the supervisor before writing, writing documentation, bending, handing, and giving oral presentation). And also, because such a project depends a lot in external resources, like laboratories or advice from the supervisors. These resources are not always 100% available (holidays, scheduled hours), so in many occasions the project is going to suffer rescheduling and changes in the time line. In the example project, a Gantt chart could be very useful for scheduling short periods of time, or work packages with small impact and not lots of activities depending of other previous or later activities. 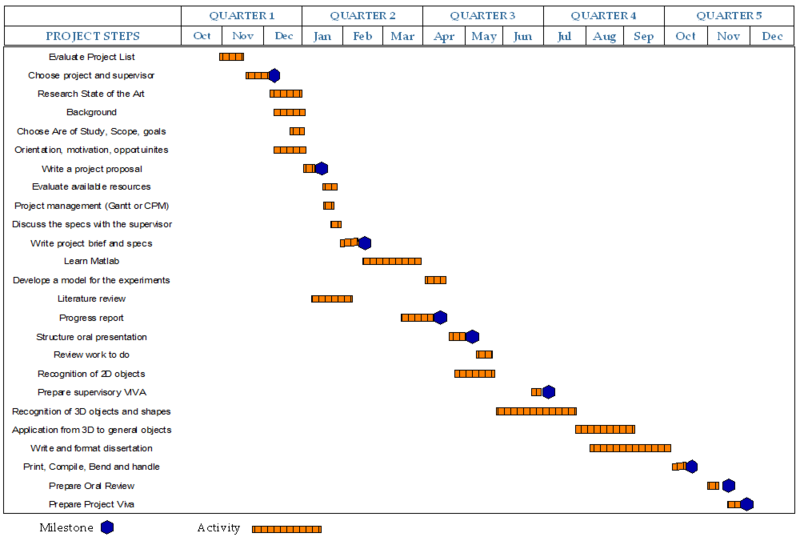 Sessions in the laboratory or work to be done during the week can be represented in a Gantt chart, and easily identified (See fig 4). It is interesting to see how visual a Gantt chart can be when the deadline for one activity is known, and the time distribution, because the length of the bar charts is proportional to the dedicated time. Sharp, A and Howard, K. (1996) The management of a student research project. 2nd Edition, Gower Publishing Ltd, Aldershot, UK. Burke, R. (2003) Project management. Planning and control techniques . 4th Edition. Willey Europe. Chichester, UK. Lock, D. (1968) Project management 7th Edition. Gower. Aldershot, UK.